"Down on the Farm with Horses", reminds me of growing up in Germany and Switzerland. The fields around our home were so small, there wasn't enough room for large fancy tractors or combines to turn around! I used stamps by Sheena Douglas (tree in the foreground and fence). The flowers and leaves on the tree are a small foliage stamp from Art Impressions. The rolling hills are "snow/sand" from Stampendous. I wish now that I'd stamped them in yellows, as the fields in the Spring were always yellow from thousands of dandelions! The horses and farmer are by Art-Kure. I used markers to color parts only of that stamp... I drew in the rest of the plowed field and short grass between it and the tree with markers... The sky is chalk... There is a hint of cumulus clouds in the card, but it didn't show in the photo..."
"Here in our are of Texas, we are entering our third year of a drought... The city has already announced "Stage One Watering Restrictions". Seems like we all just watch the sky and hope for rain!!! I know, you'll think Spring... Texas... where are the bluebonnets! But in my own backyard and along the ditches and empty lots in town the evening primroses are just having a blast! That is why the yellow in the foreground. 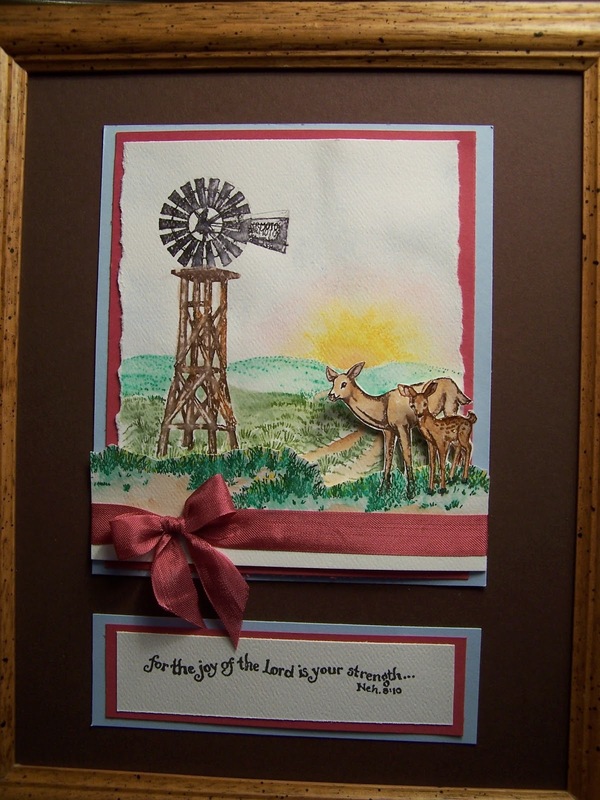 The windmill and path are both by Stamp a Mania, the distant hills are snow/sand from Stampendous. 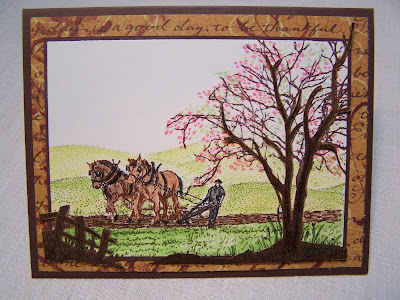 The foreground grass is by Stampin'up and was stamped twice, cut out and layered onto the card with dimensionals. The doe and her young are by Hero Arts. The fawn was also cut out and layered with a dimensional next to its mother. I used papers, ribbon, and inks from Stampin' Up. And a tiny bit of glitter on the fawn's back. The layering of the fawn was an afterthought... had I thought of it first, I would not have used my marker on the outline of the fawn when I stamped the mother. I had a hard time taking a picture that didn't show the fawn with four ears instead of two! Watercolor paper tends to bend, and after I cut out the doe, her neck just naturally curled and her head is now looking away from the picture and into the room! The fawn's head curled downwards ever so slightly. I couldn't have planned that if I'd wanted to!" It is your last week to enter you farm scenes to the challenge. Please make sure your creations are finished projects like cards and tags. You may enter up to 3 times and as many challenges as you wish. beautiful cards, Gundi. you made perfect scene. so nice to watch. I love getting updates from Craft a Scene. I'm not playing along, because honestly....I have nothing 'Farmish'. I haven't had a minute to find a digi online and play along. Everyone's doing such an amazing job, and I like seeing what the design team has created!